One of my favorite fitness activities has become Tabata workouts. Tabata workouts are intense, short duration training that follows a specific format. The name Tabata comes from the doctor and researcher that came up with the workout. The Tabata workout is quick and effective making it a nice option to incorporate into the home, classroom and therapy. 20 Seconds of a high intensity exercise. – During this time period I encourage working hard! Repeated 8 times for a total of 4 minutes. Why Tabata Workouts For The Classroom? Regular participation in physical activity improves academic performance. I love the free tabata timer apps that you can get on your iPad or smartphone. You simply have to do a search to find several to choose from. There are free and paid versions. I’m currently using a free version on my iPad. I come up with these on my own based on the skill level of the kids that I see. The exercises can be as simple as squats, running in place, lunges etc. I also have a ton of brain break cards that have several different ideas of activities that could be incorporated into tabata workouts. I like to warm up before if time allows. That may be simple dynamic exercises (marches, arm circles etc.). When doing tabata workouts I always try to include as much full body exercises as I can. For example, if I am having someone run in place I encourage pumping there arms really fast as well. Follow Pink Oatmeal’s board Kinesthetic Learning on Pinterest. 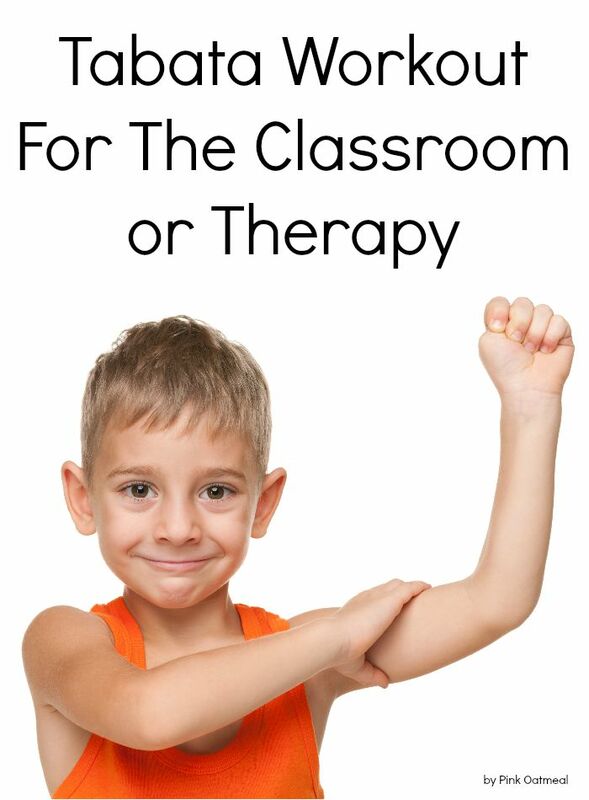 My Teachers Pay Teachers store has ideas to get the kids moving at home, in the classroom, and in therapy!